I grew up in a family that did a lot of camping. We'd go for weeks at a time, isolating ourselves on small islands in a big lake with a few supplies under a very old, smelly blue tarp. There was a little propane stove for coffee, always a fire, and everything we ate was cupped in royal blue, white-speckled enamelware that we carried around like friends. I have so many good, sensory memories associated with this material: sipping tar-like coffee from an enamelware mug, still groggy after an early morning "shower" in the lake; the clang of all the pots and pans we'd brought in a big canvas bag; waiting to dish whatever we cooked on the fire onto enamelware plates, bowls, or those same mugs. 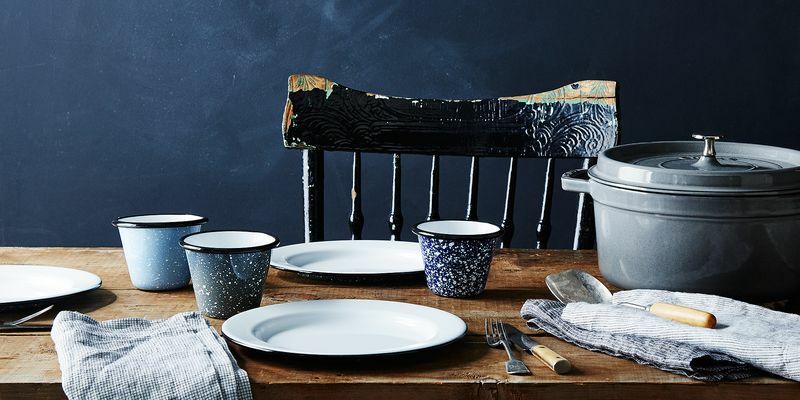 Surely one of the most widely enjoyed things about enamelware is how it looks: white and shining with blue, red, or black trim; blues and greens and reds with white splatter paint-style speckling all over; or in muted pastel colors that are so faint you can consider them part of the same set. The colors can even identify the place of origin in a vintage piece: white with navy trim from England, cream with green trim from Sweden, etc. One of the reasons enamelware became so beloved by campers is that it's light enough to tuck in a backpack or duffel. Not only does this make it appealing to use for everyday meals (in the same way paper plates are tempting because they're on the table in a flick of the wrist)—it's also great for when you have kids. It can handle most tasks in the kitchen. 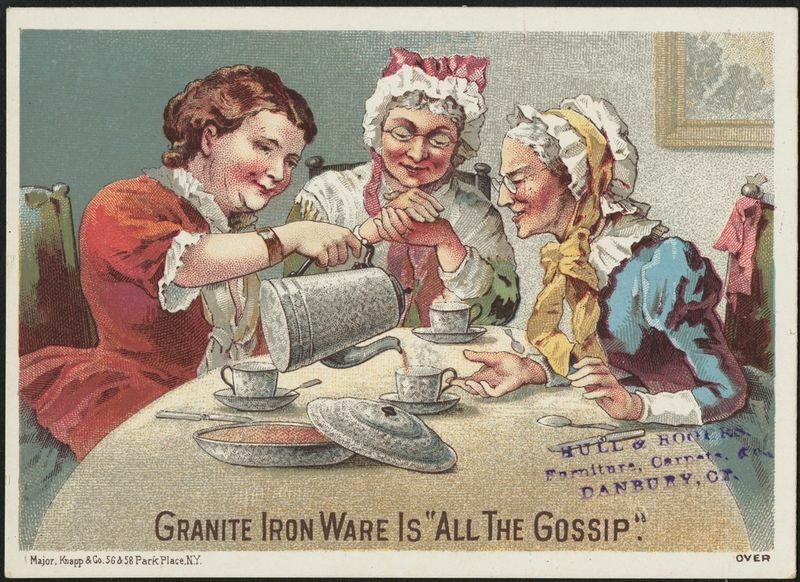 Created by fusing glass particles to the outside of a thin piece of steel (which creates the token shiny surface and prevents your food from leeching any unwanted flavors from the steel), enamelware is a great conductor of heat. While they're not best for high-heat searing, enamel pots can handle simmerring, braising, and stewing—and the mugs cup piping hot coffee as well as any piece of ceramic. The sound it makes when you clang it against anything. Almost as unmistakable as enamelware's look is the sound it makes when two pieces clang together—it's a very distinct noise, much lighter and bell-like than the sound two pots make crossing paths, and one which instantly transports me to the camping trips of my childhood. In the kitchen, it's a carefree sound amidst all the the ruckus of everyday jostling and chopping. One of my personal favorite features of enamelware is that the pieces are designed to fit flush inside one another, which is part of their natural economy. Because of this design, they take up the minimum amount of space on your shelves as well as in the bag you decide to take on a picnic. Yes, being glass-coated steel, enamelware can chip around the edges if you love it aggressively or keep it forever—but that only adds to the charm. Vintage enamelware is a common collector's item (I say that because I hoard it and so I'd like to think of it as a collection), even with a few dents and divets, and as long as the coating is intact it's still perfectly safe for use after a good scrubbing. How do you use enamelware? What are your favorite patterns? Let us know in the comments. I purchased a set of 4 plates (and mixing bowls) about 1 year ago and all 4 plates are showing chipped or flaking spots on the topside (white part). I was a little disappointed, but love them anyway. Madeline Demand In 1961 I purchase service for 6 plates, bowls and large with mug handles for $6.00.for our weekly picnics with friends .Paper plates were costly on our tight budget and you throw them away .Still have them and love all the memories. Old enamel is also my favorite I have 10-12 pieces some are chipped on the edges But this is there charm! Does anyone know how you can get enamelware repaired? I have a couple of beloved pieces that are going to develop holes in their bases sometime. Falcon Enamelware, from the UK, is great stuff: https://www.falconenamelware.com/ Their multiple piece Bake Set makes a good wedding gift.